There are many wonderful French cooking recipes to choose from and it's been really difficult to decide which ones to show you first. The ones I have listed here are some of our favourite French Recipes that I'm sure you will love. They are not sorted by any particular region; there are many different regions in France and most have their own cuisine and specialities. Modern pressures of life have seen a change in the eating habits even in France. Although the French do eat remarkably well – their food is always of the best quality – today it seems, especially in the larger towns and cities, they too are in a hurry. As a result many will eat quite simply for most days of the week either at home or in one of the fast food places that have arrived in defiance of French tradition. However, they still consider their food and family meals to be an important part of French culture as can be seen with the lengthy, unhurried meals with family and friends. Sunday, is especially an important day for the family dinner and the traditional French cuisine remains the centre of its ritual. Here are some French cooking recipes, starting with a few soup recipes which, although they can be used as starters, would on their own give you a light meal in themselves. These are followed by main meals, all absolutely delicious. A French cooking recipe classic! A truly delicious soup with a deep, rich flavour. Although I have seen some recipes for this that take less time, I feel this one has the best result for taste. Bright orange pumpkins are a vivid sight in the markets of France. And they make a delicious soup as the autumn chill hits the air. But it is equally delicious when chilled! A seasonal delicacy in Argenteuil area of France, the asparagus makes a superb soup and the flavour of freshly made asparagus soup is wonderful. A very special classic soup for special occasions or entertaining. Just supreme! A soup with all the flavour of the sea. Especially good for entertaining. A smooth and classic Vichyssoise soup or cold leek and potato soup. It is very easy to make and is great for family meals or entertaining. French cooking doesn't get any more classic than this traditional dish. Originally made with an old rooster, marinated and cooked slowly. This is actually roasted chicken with the flavours of lemon and thyme. The smells from your kitchen will be divine! A great dish that is quick to prepare and excellent for entertaining. Did I forget to say its tasty - yes, it's delicious! A tasty French cooking recipe to feed a hungry family or great for entertaining as it can be made ahead and kept in a warm oven. 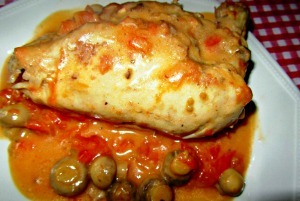 Chicken Célestine is a sensational chicken dish that will be popular with your family and friends. 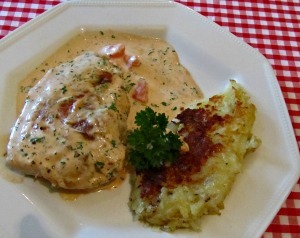 A dish full of flavour and a delicous creamy sauce! It's a winner all round. 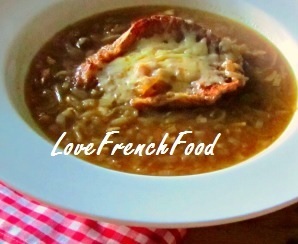 There are many versions of this dish from the South West of France. This is one we love so I hope you do too. Very appetising and makes a hearty meal. This pork pie recipe originates in the Ardennes region of France and includes chestnuts and apples. Ideal for a winter meal and especially for the Christmas holiday. Also known as a Navarin. This one is made with lamb and a variety of vegetables. This is another one of my favourites as it goes down really well with everyone. An easy and quick lamb chops recipe with a wonderfully fresh vinaigrette dressing. A traditional French family meal! It is very easy to make and can be made the day before so is great for entertaining and is full of flavour. A healthy venison stew or daube with tasty forcemeat dumplings. A very tasty recipe to make your pork chops that little extra special!